FLY HAS IT! Maji Wilds is a swampy-themed slot game at Omni Casino that comes with 50 pay lines for maximum thrills. The game displays classic A, K and Q symbols made from bones along with skulls, bottles of potion, crocodiles and a mysterious woman and a masked character. Wild – this is an extra standard wild. Snake Wild – this slithers across the reels and leaves a trail of wilds in its path. Bad Spirit Wild – this creature possesses other symbols and turns them into wilds. Voodoo Doll Wild – this wild will remain locked in position for 5 spins. A pin is removed from the doll with each spin. 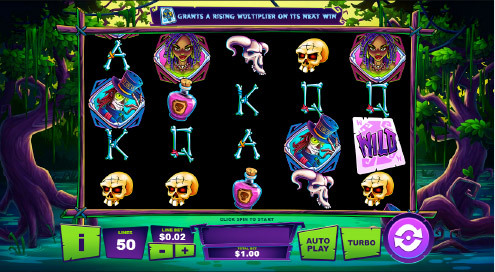 Shrunken Head Wild – a multiplier increases with each winless spin, up to a maximum of 5x. You can sit for hours in relative relaxation along with just the right amount of excitement and mystery! Try it this weekend, it’s a great game! 108% Sunday! On Sunday from 00:00GMT until 23:59 GMT, all members on their deposit of just $/£/€30 or more will receive a 108% bonus up to $/£/€108 bonus. $77.00 X 2! From 00:00GMT until 23:59 GMT, all members on their deposit of $/£/€30 or more will receive a 77% bonus up to $/£/€77.00. Claim it 2X! 125% BIG TUESDAY! From 00:00GMT until 23:59 GMT, all members on their deposit of $/£/€30 or more will receive a 125% bonus up to $125.00 bonus.